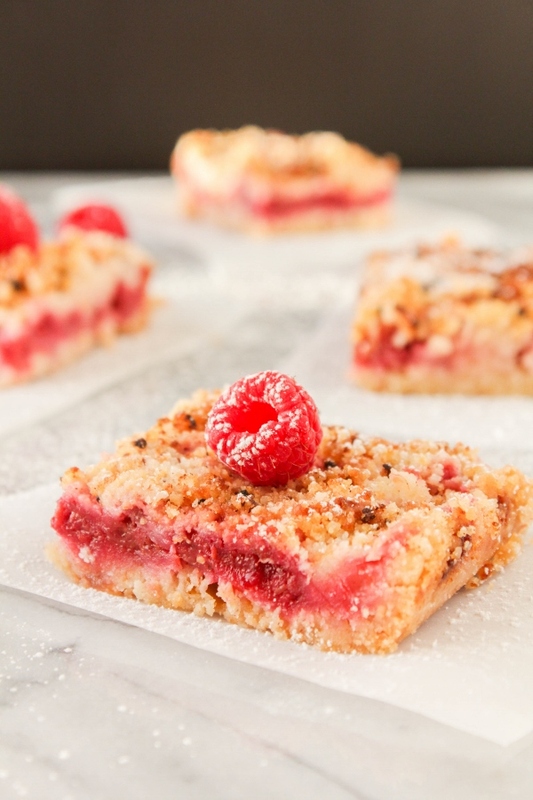 Celebrate spring with these delicious Raspberry Crumb Bars! This easy to make dessert has a buttery crust and topping, with plenty of fresh raspberries in between, and gets finished off with a dusting of powdered sugar. Dessert perfection! Now that spring has finally arrived I'm really into fruity desserts. To me, citrus fruits and berries = warm weather. Not that you can't enjoy these things in the winter, but something about them makes me extra happy in the spring and summer. 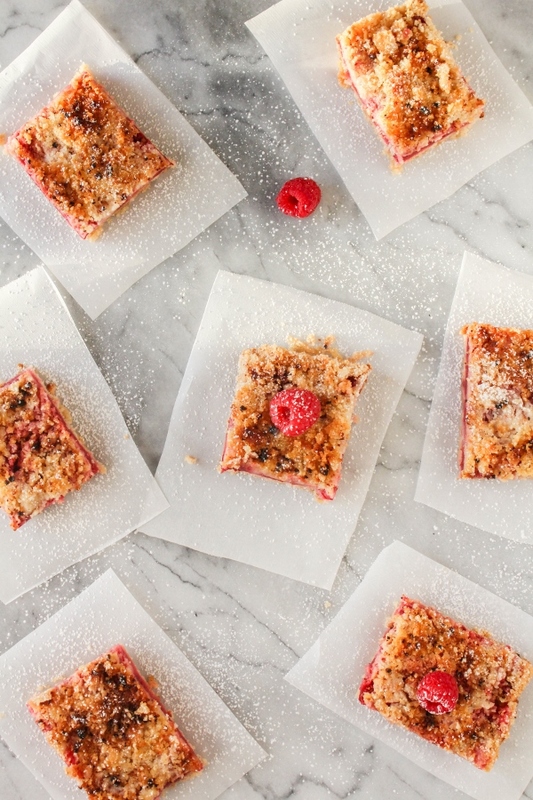 After making these Raspberry Crumb Bars I was ready to break out my flip flops and go sit on my deck! Maybe not just yet, but soon. 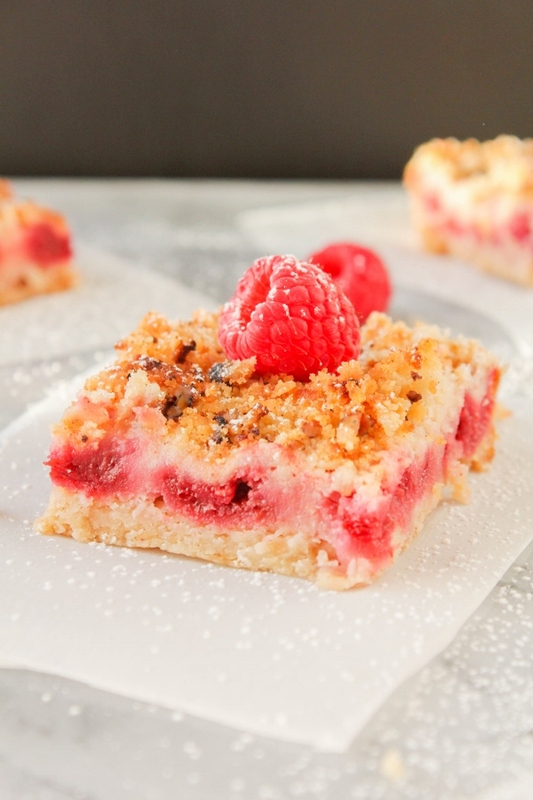 The combination of buttery dough, reminiscent of shortbread, and sweet raspberries makes these bars one of the best desserts I've ever had. The bars are extra soft and full of flavor, and super easy to make. Plus they can feed a crowd, so they're perfect for any spring gatherings, Easter, or a summer barbecue (once the time is right). You can substitute other berries in this recipe if your not a big raspberry fan. Blueberries, blackberries, even strawberries, would all be delicious. Preheat the oven to 375 degrees. Spray a 13 x 9-inch baking pan with non-stick baking spray and set aside. In a large bowl, whisk together the flour, 2/3 cup of the sugar, lemon zest, cinnamon, and salt. Cut the butter into small cubes and them to the bowl, along with the vanilla. Using a pastry cutter or two knives, work the dough until it resembles crumbs. Transfer half of the dough to the prepared pan and firmly press it into the pan evenly. Bake for 10 minutes. In another bowl, gently toss the raspberries, remaining 1/3 cup sugar, lemon juice, and cornstarch. Spread the berry mixture over the crust. Pinch small clumps of the remaining dough and drop them all over the raspberries. Bake 50 - 55 minutes, or until the topping is golden brown. Cool completely on a wire rack before cutting into squares. Dust with powdered sugar, if desired. As a Milk Means More Ambassador, I was compensated for developing a delicious cookie recipe using dairy. All opinions, as always, are my own. Thank you for supporting the brands that make this blog possible!